Apple tablet sales may have been lower this past quarter than analysts expected, but usage of the tablet remains strong. 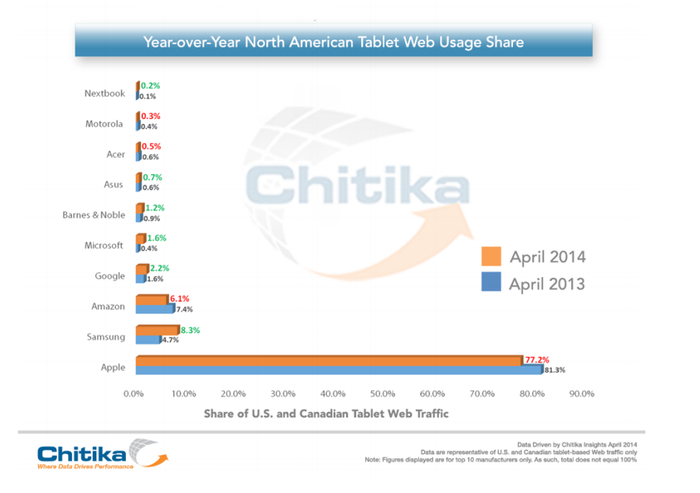 According to a recent Chitika Insights report, the iPad accounted for more than three quarters of all U.S. and Canadian tablet-based Web traffic in April. Chitika derived this traffic data by sampling tens of millions U.S. and Canadian tablet online impressions across its ad network during the first week of April 2014. The iPad is the dominant tablet in North America with a mobile web traffic share of 77 percent as compared to 8.3 percent from number two Samsung. Amazon's Kindle Fire devices generated 6.3 percent of web traffic, while Google's Nexus tablets accounedt for 2.2 percent. 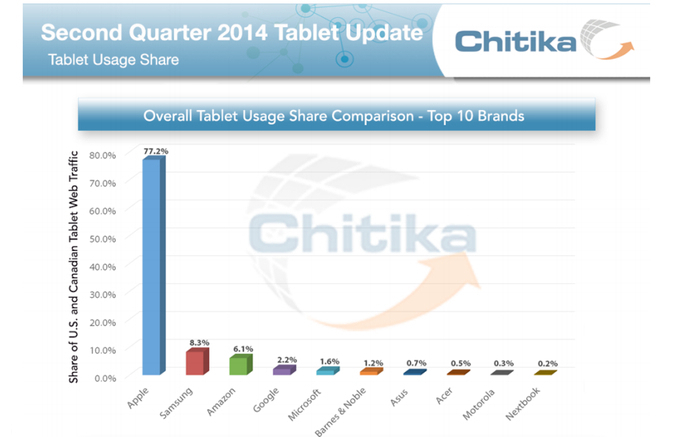 The remaining tablets from Microsoft, Asus, Acer and others contributed 4.5 percent combined. Though the iPad is the market leader with significantly more web traffic than all the other manufacturers combined, the tablet's traffic share fell slightly year over year from the 81.3 percent measured in April 2013. Samsung showed the biggest yearly gains, growing from 4.7 percent in April 2013 to 8.3 percent in April 2014. Amazon, similar to Apple, also lost 1.3 percentage points year over year. The proverbial elephant in the room is iPad usage share, which still stands at over 77% of all U.S. and Canadian tablet-based Web traffic (Section 4). This is down a few percentage points year-over-year, but the current share is very notable in the context of the North American tablet market, which analyst estimates pointed to growing significantly throughout 2013 from a penetration standpoint. While it is uncertain if Apple can reverse the tide and grow its domestic tablet usage share in the coming months, it is clear that iPad users remain the most active aggregate tablet user base by a wide margin, with that likely to remain the case for the foreseeable future. During Apple's Q2 2014 earnings conference call earlier this week, CEO Tim Cook commented on the slight drop in iPad sales this past quarter, citing high channel inventory levels that artificially inflated the company's March 2013 sales. Channel inventory in 2014 was significantly reduced, with a balance between iPad supply and demand achieved early in the launch cycle of the iPad Air and Retina iPad mini. Apple is expected to introduce updated versions of the iPad Air and Retina iPad mini later this year. The company also may be developing a 12.9-inch iPad Pro that could possibly debut sometime next year.